Melissa Bright, principal architect, describes the aesthetic for the new building as “shed meets Japanese house”. Located close to the CBD in Melbourne’s northwest, Essendon has transformed dramatically over the past 20 years into a gentrified suburb, but with a wide range of house styles and building types. 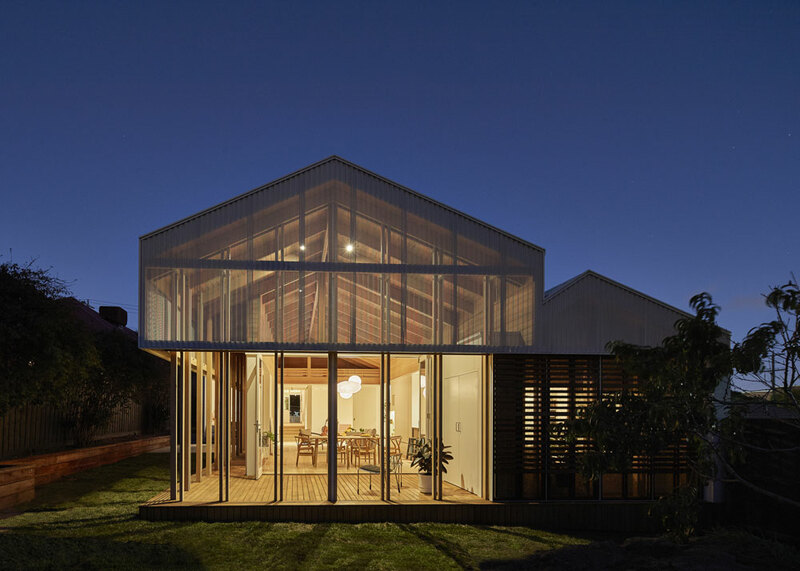 Translucent sheeting wraps the pavilion space, muting the light and changing from day to night. Originally belonging to the client’s grandmother, the house had significant sentimental appeal. 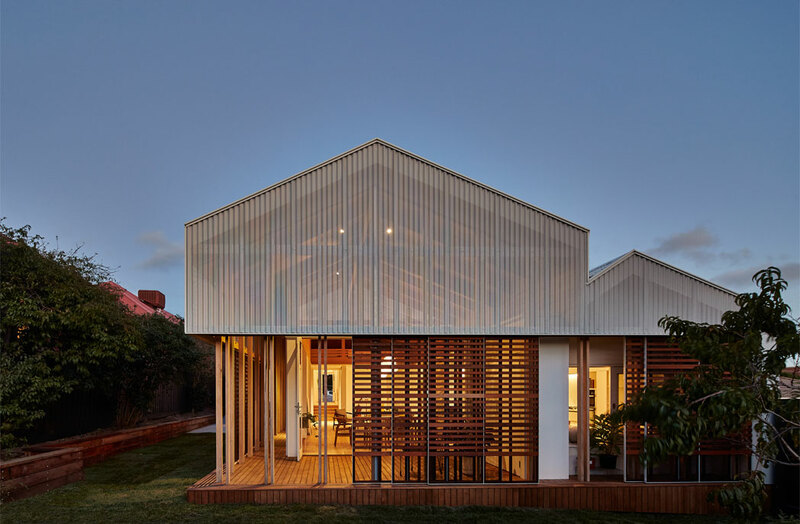 The existing dwelling was a timber-framed, weatherboard- clad and tin-roofed Victorian home with some charming interior fretwork, pressed metal detailing, and a hipped and gable articulated roof form typical of the period. The overall feeling [in the house] is one of a softened light source. 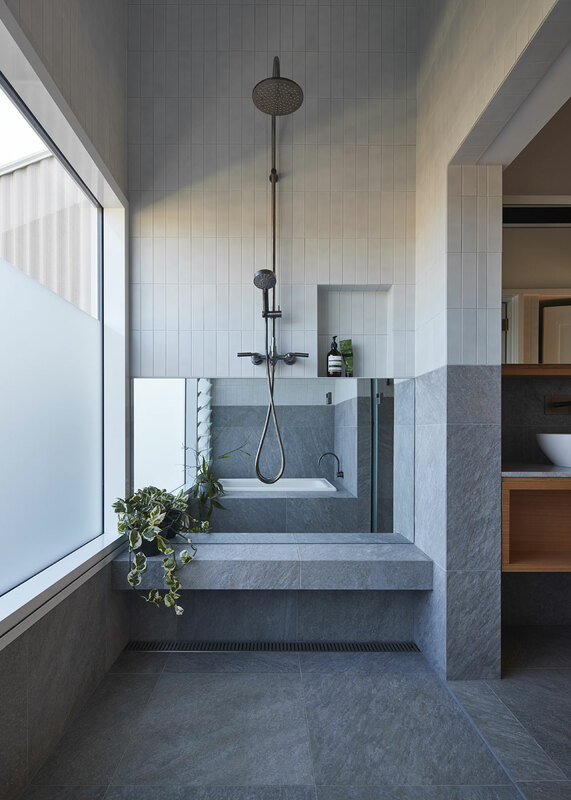 One of the key driving ideas for the design was to create a space that both embraced the site, but was also a buffer from the harsher elements of living in suburban Melbourne. The junction between the old and the new is quite intentionally distinct with the geometry and scale of the new pavilion creating a clear visual break from the existing house. It has also been cleverly offset towards one side boundary to allow the sun and garden to penetrate the internal spaces. A traditional Japanese-style bathroom has been incorporated in the home. from the weather. 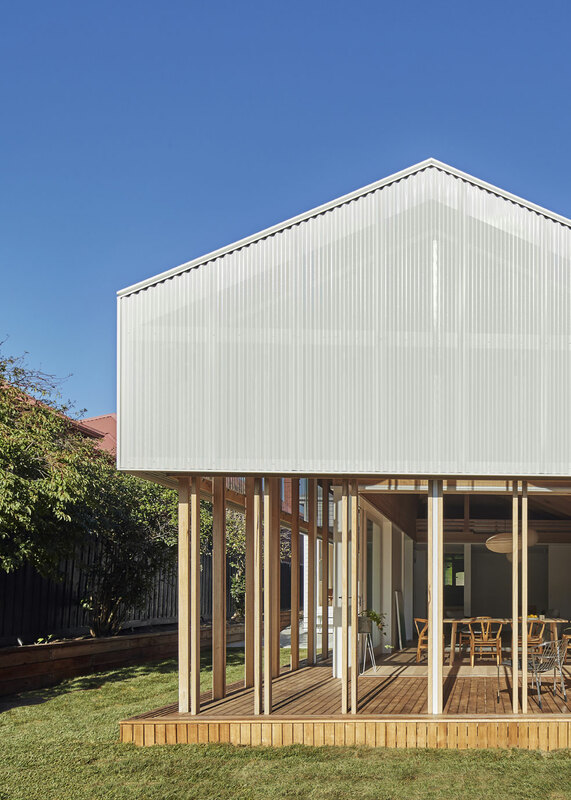 Make Architecture has substituted the traditional rice paper for the ubiquitous flywire as a pragmatic solution to the insects and climactic challenges of the Australian environment. 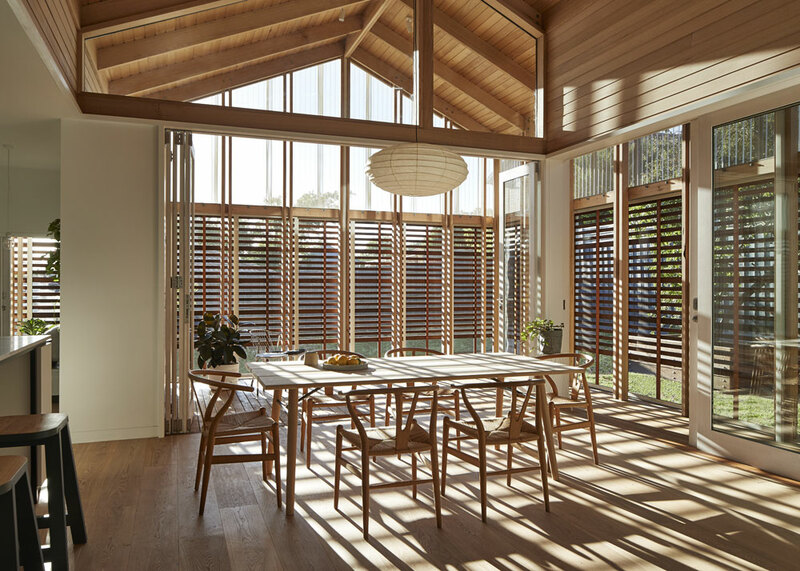 In this spacious and airy pavilion, the sliding amado screens form the outer skin of the building, providing a transition space that blurs the definition of interior and exterior. It also offers options for either sitting in or strolling around the perimeter. 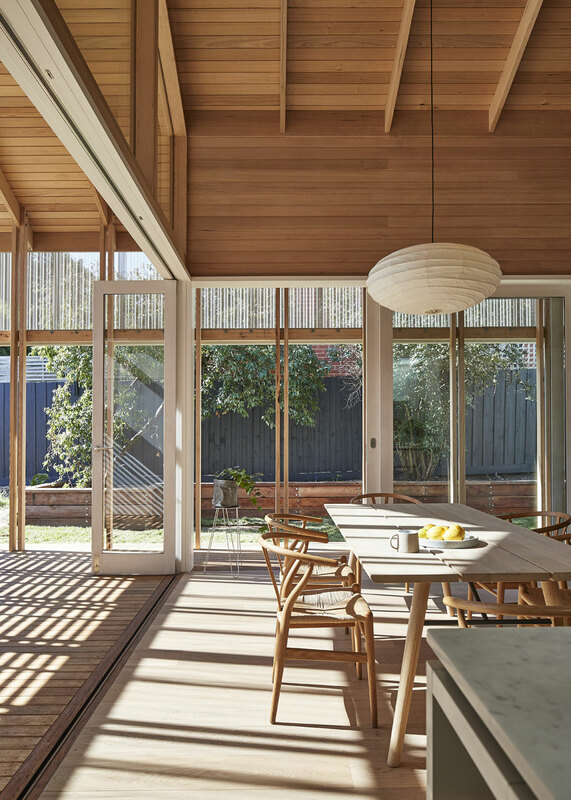 The space brings great flexibility in the variety of ways that opening glass and opening screens can work together to adapt to the unfolding weather that is a key feature of living in Melbourne. 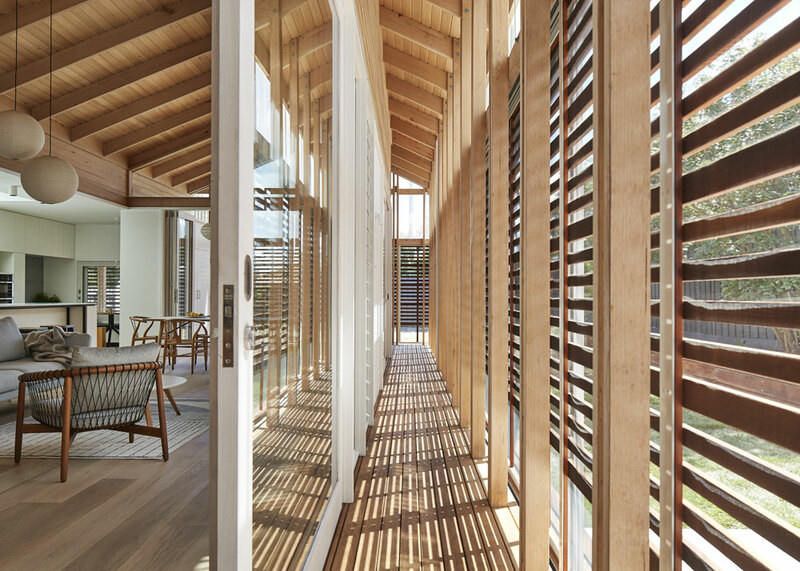 The engawa, much like a wrapping veranda, is a threshold between inside and outside. Translucent sheeting wraps the building. The Amado house is a superb example of Make Architecture’s sensitive and considered integration of the clients’ personal and cultural values, yet also incorporating the equally important practical and financial considerations. Make has created an oasis of shelter and tranquility, supporting the requirements for a space that is contemplative, private and flexible. The brief required spaces to sit quietly sipping tea and gazing into the garden, or entertaining, plus places to house and appreciate treasured objects. It could be argued that the integration of all of these features and details have helped to ease what could have been a difficult transition from life in Japan into Australia with its own unique cultural backdrop. This article originally appeared in MEZZANINE #10: The Simple Things Issue. Get your subscription to MEZZANINE here – or digitally through Zinio. See another beautiful residential project, The Shadow house by Matt Gibson Architecture & Design with Mim Design.